By Fionnuala Holohan | April 12, 2011. Work is due to start in the summer on a public pathway through St James’ graveyard, the Dublin City Council (DCC) has announced. The pathway will provide a safe route for relatives and visitors to get around the graveyard. It will be a raised gravel path, 1.2m wide, illuminated with low-level lighting and sitting on the surface so as not to disturb the graveyard. The graveyard key, which has proved to be elusive in the past, will be passed on to local custodians of the church, which stands on James’s Street near the site of the old James’s Gate. It is expected that the path will be completed by autumn. This first step in reclaiming the graveyard for visitors is part of a larger plan for the Church of Ireland graveyard and the old church. The plan included a tree-level walkway through the graveyard trees, looking out over Dublin and a ground level access path. The closed and deconsecrated church is considered a key part of any future development of the site but as it is currently in private hands, it cannot be formally included in the plans. Up until June 2009, the church was the home of the Lighting World shop, which went out of business in June of that year. Many of the meeting attendees and respondents to a survey by the architects from a previous meeting were descendants of those buried in the graveyard. Several had close relations buried there within the last 50 years, having retained the burial rights after the graveyard was officially closed. Margaret Hardiman, another ex-resident, found her father’s newly uncovered grave in the architects’ photograph catalog – listed as No. 22. Her father was killed in an accident on the Navan Road in 1989 and was buried in the graveyard, after a difficult hunt for the graveyard key. “The passenger in the car that hit him was a priest on his way to give his first blessing,” she said. Tragically, it was to her father who the priest was to give his first blessing that day. Opinion at the public meetings for the plans was overwhelmingly in favour of increased access by the public and its designation as an arts and heritage site. Respondents were firmly against both the removal of graves and of commercial use of the site. The next step for the project, aside from the approved pathway, is to elaborate more fully on the plans in order to develop detailed costs and to secure funding for the different phases. DCC are looking into getting the church listed so that it can be better integrated into the overall plan. 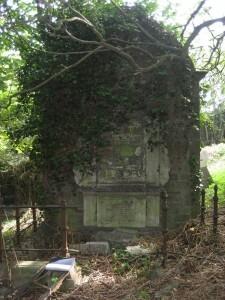 The church and the graveyard have also been included in the new east-west tourism trail announced by Fáilte Ireland in January 2011. This trail will extend from Trinity College in the east to Kilmainham in the west, creating a “single co-ordinated walk” along Dame Street, Thomas Street and James Street. Tourism is a key factor for the funding of this work and the graveyard plan. British tourist numbers have fallen off in the last two years, according to Fáilte Ireland, and this trail may particularly appeal to them. 1190: The church and cemetery is built lands donated by Henry Tirel – including the tithe of a mill in St James’ parish and of fishing from a pond next to the mill. 1181-1212: Parish boundaries set – from Newgate (the western city gate) in the east to Kilmainham to west ,and as far north as Bridge Street. 1495: Earliest reference to a burial at the church or graveyard is in the will of Walter Soggn, in 1495, where he states he wants to be buried in ‘the church of St James’ without the city’. 1954: Closed for burials, though some families retained burial rights. Catholics and Protestants, bishops, earls, scholars, brewers, distillers and the ordinary people of Dublin all lie together in St James’ graveyard, a testimony to its long and varied history. Henry Rochfort, of the Earls of Belvedere in 1665, Sir Stephen Rise, Baron of the Irish Exchequer in 1714 (despite being a Catholic), James MacDonnell, son of the third Baronet of Mayo, two infant brothers of the political philosopher Edmund Burke, and a volunteer executed for his part in the 1916 rising were all laid to rest in the graveyard. Penal laws introduced in the late 17th century meant that Catholics could not maintain cemeteries, so St James became one of the most popular burial grounds for Catholics during penal times. Afterward, in the late 19th century, the tradition became that Catholic paupers were buried Glasnevin and Protestant in St James’. A significant Catholic memorial in the graveyard is that of Sir Toby Butler, Solicitor General of Ireland, who died in 1721. A lengthy Latin inscription on the tombstone erected by his son James, praised his father’s humour and virtue and acclaim as an expert in law, which, “were it not for his religion, [would] have raised him no doubt to [the summit of] fortune”. The gravestones of the ordinary people often revealed more about the times with occupations and addresses being listed on many gravestones. There are many indications of the high infant mortality rates in earlier centuries – siblings and parents often being interred with their infant brothers or sisters or children. The graveyard however has been the focus of much local and archeological interest for many years. It is one and a half acres in size and circles the church on three sides. It slopes steeply downward to the north – the patch of green can be seen from the north quays, rising above the top right hand corner of the Guinness site. It is a terrain largely unchanged since Viking times. The graveyard is believed to have been in existence as long as the chuch i.e. in use from the late 12th century onwards. According to the burial registers which started in 1742 and ended in 1989, more than 30,000 burials have taken place in the graveyard. These do not include medieval or unrecorded interments. A FÁS grave and site survey in 1988 discovered a headstone from 1627 and two stones which are likely to have been part of the medieval church. In all the survey mapped 705 tombstones and recorded around 500 inscriptions. After this initial clearing of the dense undergrowth by FÁS, the graveyard gradually went back to nature. In July 2010, Dublin City Council (DCC) commissioned Bernard Seymour Associates to conduct a feasibility study on the site. This involved two rounds of open public consultation, the careful uncovering all the graves and monuments and rubbish removal in order to investigate the topography, ecology and archeology of the site, and extensive historical research. As the architects and DCC progress the plans arising from the study, one requirement is critical – local custodianship of the graveyard and its key, so that it does not fall so far into neglect again. My grandparents are buried in James St graveyard, I always wanted to visit to see if I could find their grave. I went to visit last week and found that the graeyard was closed, would it be possible to make an appointment to visit as I would love to see if I could find their grave. Is there a list of the names of the people who are buried in this graveyard? Thank you for any help you can give me with this matter. Thanks for your comment – I’ll get an update on your questions and come back to you in the next week. impressed! Very helpful information particularly the ultimate phase 🙂 I maintain such information a lot.